A home equity line of credit can be a powerful financial tool to help fund home improvement projects and manage big expenses. It often comes with a lower interest rate than other credit options and, like your mortgage, the interest you pay may be tax-deductible — consult your tax advisor to find out if it is for you. However, although all home equity lines of credit are designed similarly, some lenders provide special features within their offerings. It’s the responsibility of the lender to present and explain home equity lines of credit that have special features, so if anything is unclear to you be sure to have your lender clarify the specifics. 1. Pay less interest and rebuild your equity faster. Some lenders require interest-only payments on their home equity lines of credit, meaning your balance never goes down during the draw period. Wells Fargo has a payment structure that includes interest and principal, which means you automatically pay down a portion of your principal balance every month. As your balance is reduced, so is the amount you pay in interest. All of which helps you rebuild your equity from your very first payment. 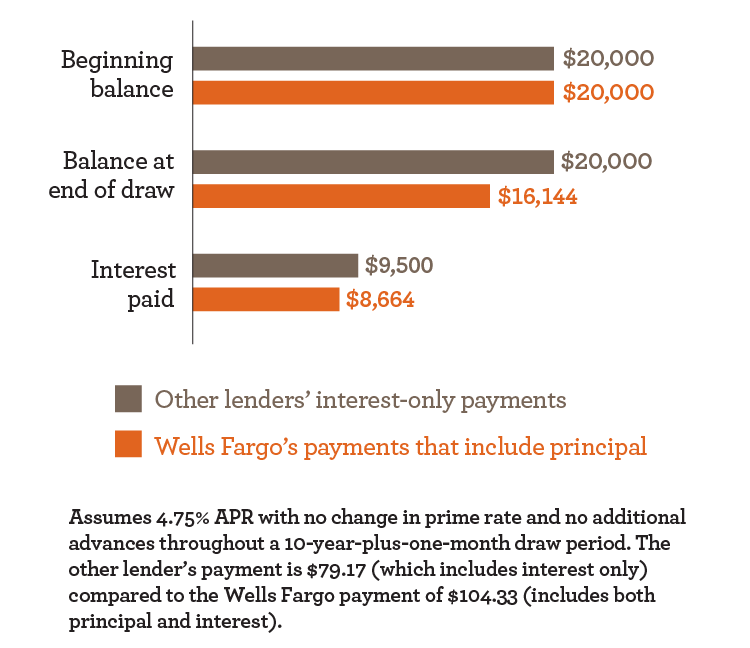 A bar graph showing how a lender’s interest-only loan compares to a Wells Fargo loan that includes principal in your payments. Beginning balance of both loans is $20,000. The balance at the end of the draw period for the interest-only loan is $20,000. The balance at the end of the draw period for the loan through Wells Fargo is $16,144. The interest paid on the interest-only loan is $9,500. The interest paid on the loan through Wells Fargo is $8,664. Assumes 4.75% APR with no change in prime rate and no additional advances throughout a 10-year-plus-one-month draw period. The other lender’s payment is $79.17 (which includes interest only) compared to the Wells Fargo payment of $104.33 (includes both principal and interest). The example above illustrates the benefits of principal-reducing payments on a $20,000 cash advance from a home equity line of credit. Our Wells Fargo customer not only paid down $3,856 in principal, but also paid $836 less in interest during the draw period, compared to someone who paid interest only. 2. Protection from rising rates with interest rate caps. Home equity interest rates are tied to the prime rate. If the prime rate increases, so does the annual percentage rate (APR) on the line of credit. But by obtaining a home equity line of credit with annual and lifetime interest rate caps, you won’t have to worry about extreme rate changes when interest rates rise. With a home equity line of credit from Wells Fargo, the variable APR on your line of credit will never increase more than 2% annually based on the loan opening anniversary date, and will never be more than 7% higher than where you started. The table below shows the benefit of rate caps. Assumes a prime rate of 3.5% and a margin of 0.5% at account opening. If prime rate decreases, so does the APR, but it won’t go below the floor APR of the account. 3. Fixed-rate advance options. Look for flexibility in your home equity financing. Check to see whether your lender will allow you to convert all or a portion of your line of credit balance to a fixed-rate advance with a fixed APR for a specific time period. This approach can help if you’re concerned about rising interest rates or want to ensure your balance is paid off in a set period of time. 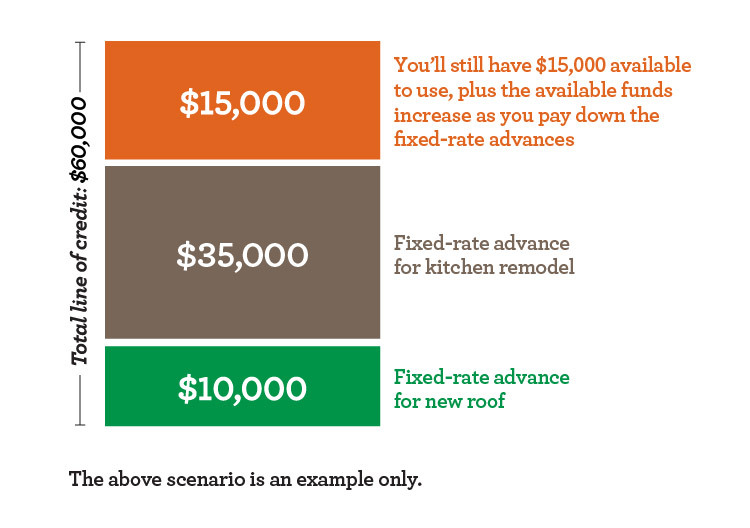 Here’s an example of how a fixed-rate advance may work for you. Let’s say you’ve remodeled your kitchen and used a fixed-rate advance to pay for it. 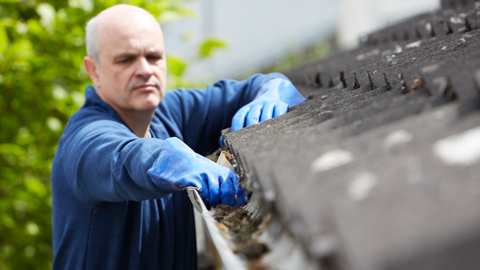 Then you find out you need to replace your roof, so you take another fixed-rate advance to cover the cost. You’ll still have access to the unused portion of your line of credit to help cover any other repairs or renovations. And as you pay down the fixed-rate advances, your available funds have the potential grow. A visual example of how a $60,000 line of credit could be used to replace your roof ($10,000) and remodel your kitchen ($35,000). These repairs may not use the entire line of credit leaving you an unused portion of $15,000 to help cover additional repairs and renovations. This is an example only. Home equity lines of credit are one of the most widely used ways homeowners take advantage of the equity in their homes. Make sure to consider one that’s been designed with your financial success in mind, to help you use the equity in your home responsibly. 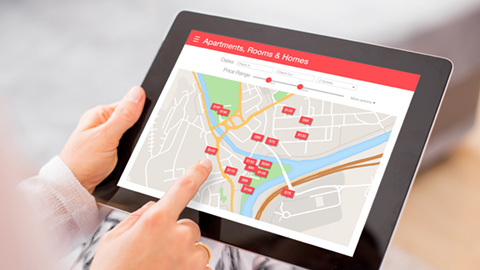 Ready for your next big project or need access to funds? Wells Fargo offers these three key features in home equity lines of credit. Contact Wells Fargo for more information on your options for buying, refinancing, or other lending options.